Guangdong Karel Robot Co., Ltd was established in 2002, is a new high-techenterprise which focuses on R&D, production and application of industrialrobot and automatic production line. In May 7, 2018, Roly Jiang, the directorof foreign trade department, led foreign trade and R & D team to Orlando,USA, to participate in the 5 day National Plastics Exhibition. 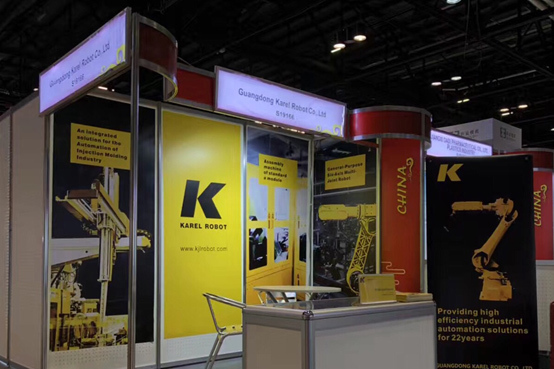 At theexhibition, the Karel team promote to the audience about the automaticassembling line and the application of the robot arm for injection moldingmachines. We have attracted a number of prospective customers and customizedthe corresponding automation solutions for them, which has been highly affirmedby our customers. Since the companyestablishment, in order to adapt themarket demand and better serve the customers, we have established a R&Dteam with rich experience and high quality and perfect production, sales andafter-sales system; the products are exported to Southeast Asia, NortheastEurope, Africa and other countries. Ouradvantage is quality and service, technology and R & D integration, with aninternational perspective of innovation, to reach a new height.